Next to dying, people rank public speaking as the most anxiety-inducing experience they have to face. But it’s also key to one’s success. You may be an expert in your field, but if you can’t communicate that expertise to others, it will remain your secret. 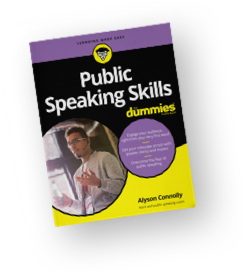 Whether you need to make presentations to clients, outline your objectives to your banker, or lay out the future of your company to your employees, your public speaking skills can be the difference between success and failure. Overcoming your anxiety of public speaking is vital to reaching your potential. I treat public speaking as a performance. Just as an athlete gets revved up when he/she is ready to perform, you must have a certain amount of energy when you get up in front of people to make your presentation. The key is to control that energy through preparation, breathing techniques and understanding the psychology of the speaker/audience relationship.